In this month’s Spice Trail, I am calling on fellow food bloggers to get carried away with caraway. As with most foods, caraway holds nostalgic associations for me. Just one sniff and I’m straight back to North London as a young girl, visiting my Dad during the summer holidays; being taken to a corner shop Jewish bakery somewhere between Tottenham and Stamford Hill, where the whole shop is filled with the distinctive, heady aroma of caraway, and from where we come away with warm bread rolls, rum babas and, my favourite, big fat rum truffle chocolate cakes. Indigenous to Europe and Asia Minor, this seed has been long used in Arabic cooking. The plant looks a bit like carrot leaves (same family), with its hollow stalks, and the pre-seed flowers are pinkish. Became popular in Elizabethan England mainly as a sweet snack, sugared and called comfits. The flavour can be most easily discerned in rye bread. Caraway is also big in Jewish food, harissa, apple dishes, sauerkraut and a delicious after dinner stickie drink called kummel (those little seeds are excellent for digestion – just chewing on a few can really take your wind away). One of the oldest cultivated spice plants in Europe, going back to the 13th century. If you don’t have any… go and get some. It’s worth the trip and this spice walks alone. Caraway is a spice I don’t cook with all that often. But when I do, I wonder why I don’t use it more. That’s why I really can’t wait to see what recipes you come up with this month, as I’d love to cook more with caraway. If the honour of being crowned The Spice Trail’s caraway king or queen wasn’t enough of an incentive, this month our winner will also receive a gift bag full of fantastic spices from the good people at Bart Ingredients. The Bart Ingredients Company has grown over the last 50 years and now sources ingredients from across the globe. Back at the Bart base in Bristol, their culinary experts work with flavours to create herb harmonies and spice symphonies, which add an extra touch of magic to home cooked dishes. By working with suppliers in different corners of the world, they have come to realise that not all ingredients are equal and a myriad of reasons can change the flavour profiles of our favourite spices. You may enter as many recipe links as you like, so long as they feature this month’s key ingredient, caraway seeds. Send your recipe URL to me at vanesther-at-reescommunications-dot-co-dot-uk, including your own email address and the title of your recipe or post. The closing date this month is Wednesday 26 February 2014. 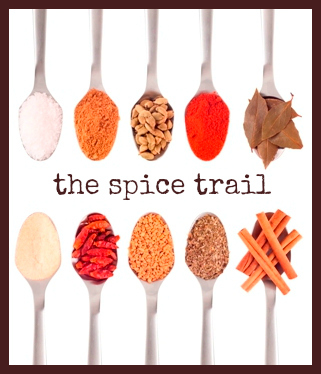 Feel free to republish old recipe posts, but please add the information about this challenge and The Spice Trail badge. 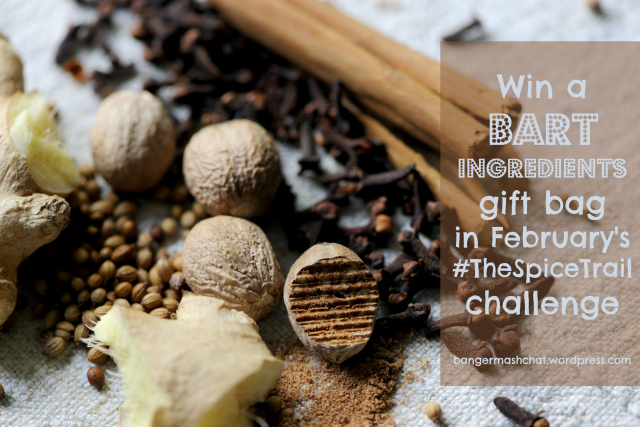 At the end of the month a guest judge will choose a winning recipe and the winner this month will receive a tasty gift box from Bart Ingredients. So what caraway dishes will you come up with for this month’s Spice Trail? Any questions, please tweet or email me. And if you’re wondering where the round-up of January’s Spice Trail challenge is, which saw us cooking with paprika, I’m working on it now and it will be with you very soon. So watch this space! I love caraway but don’t use it enough. I always put it in my saurkraut though. Ooh now Caraway speaks to me of my Polish childhood too – caraway bread and carrots roasted with caraway. I’ll have to think of some clever uses and enter. I don’t cook with caraway very often either. It’s not one of my favourite spices but I’ll see if I can come up with something. I like carrots with caraway…not a recipe as such, I just cook carrots, then toss in butter with some caraway seeds added. Really delish! I’m a huge fan of caraway. My mum used to make seed cake and also add it to little fairy cakes, I haven’t used it for some time. Don’t know if I’ll be able to join in because of the building work in my kitchen but I will see what I can do. I think that caraway has to be about the only spice missing from my spice cupboard. Any excuse to add to my collection! Caraway is one of those spices I have come to love, but wasn’t overly fond of as a child. If only I hadn’t run out, I’d have used it in my bread. Just keep forgetting to buy more – better get on to it. I love caraway, gives such a distinctive taste. Will definitely try and enter this month’s challenge. Love caraway ! actually loves all spices ! will certainly link up to this Vanesther!